Healthcare Provider CPR course contents are written by a team of U.S. licensed board certified medical doctors. 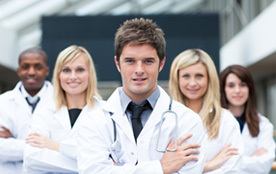 Healthcare certifications are signed by licensed and authorized U.S. board certified physicians. Print Online Healthcare Provider CPR Certification or receive your wallet card and certificates by mail. A job may require a CPR and AED certification. Another requirement may be to keep up to date with various life-saving techniques by taking a course in BLS for healthcare providers. At the American Academy, online CPR for healthcare providers and automated external defibrillator courses are free to everyone. The curriculum teaches everything needed for basic lifesaving, the skills and experience needed to save a life through cardiopulmonary resuscitation and other measures. Following completion of each course and its test, a certificate can be ordered. Qualified doctors and health care professionals with years of experience provide course information on cardiopulmonary resuscitation techniques and appropriate use of automated external defibrillators. American Academy also has some of the most comprehensive online courses for cardiopulmonary resuscitation, AED, and BLS. Finely detailed charts, diagrams, videos, and accurate illustrations assist in learning the proper technique every step of the way. Receive individualized learning without leaving your home or office. American Academy's courses on CPR for healthcare providers cover such important topics. These include basic methods of cardiopulmonary resuscitation for adults, children, and infants, human physiology, emergency scene assessment, artificial life support mechanics, and step-by-step emergency response processes. These valuable skills provide the basic ability to respond quickly when a person suffers sudden cardiac arrest. Keeping your CPR and AED skills fresh and your certification current is the best way to ensure procedures that are quick enough to save a life. Easy online training and certification. American Academy's BLS CPR course for healthcare providers is available online. This course allows online education from the comfort of the home and fits with any schedule. There is no need to sign up for a six-hour class that will cost valuable time and money. The company also offers first aid courses and BLS for healthcare providers. Other courses include cardiopulmonary resuscitation for adults and a bloodborne pathogen course. Learn a wide range of life-saving skills right here, right now. Why do so many healthcare workers turn to the American Academy for BLS for healthcare providers and AED certification? The courses offer a variety of in-depth information, including differentiation between a sudden cardiac arrest and a heart attack so that cardiopulmonary resuscitation, AED, and other life-saving measures can be used. During SCA, the heart stops beating, but proper use of an Automated External Defibrillator can shock the heart back into rhythm. Although many people die from a sudden cardiac arrest, because of the administration of proper cardiopulmonary resuscitation, others survive to live normal, happy lives. As more public buildings, businesses, shopping centers, churches, convention centers, train stations, and airports install AEDs, it will become critical for individuals to know how to use this lifesaving equipment. The cardiopulmonary resuscitation certification course teaches the use of an AED to save someone's life. The first step is simply to take American Academy's free courses. Having read the materials and practiced the techniques, one takes the BLS for healthcare providers test (twenty multiple choice questions). Free online courses provide a way to integrate solid CPR and AED knowledge into a busy schedule. Get a new certification or renew a present or expired certification . Certificates can be printed out at home for just $14.99. An ID card for purse or wallet will be provided. Each session can be taken at your convenience. The more certificates one gets the less expensive it is. Pay just $12 for a second certificate and $6 for each after that. The courses designed by medical doctors and various health professionals. Do not put off earning a cardiopulmonary resuscitation and AED certification. This online BLS for healthcare provider's course is easy to take, yet provides all the necessary skills to save a life. Complete the Contact Us form. American Academy will address any concerns, and a path will be opened to a better life through the BLS for the healthcare provider's certification course. U.S. board certified medical doctors with years of experience provided and developed this course content. Our certifications are signed by practicing U.S. physician. Healthcare provider courses on this site are designed to teach necessary skills and provide the tools needed to save lives. This would apply to a nurse or a doctor who needs to stay CPR and AED certified to meet job requirements, or a nursing-home assistant who wants additional training.